Cedric the Vintage Van was born in France in 1971, one of only 473,289 ever produced. His life prior to 2003 is somewhat hazy. Some say he was used as a daily commuter through the Pyrenees whilst others say he was an underground French movie star driven by Gérard Depardieu. If you have any information on Cedric’s past please let us know. We first heard of Cedric in late December 2009 when Uncle Bill spotted his iconic Citroen badge through a fence in a South Wales scrap yard. A few Chinese whispers and one international call to Taunton (England) sent the dream team (Lewie, Rhys and Rhys) on route to Cymru to see what all the fuss was about. Cedric was in a sorry state having been neglected for the previous two years. However, “love at first site” would be an understatement. Seeing past the superficial moss, rust and bird poop which covered the majority of Cedric’s exterior we could visualise this H-Van becoming the stunning Vintage Van that he is today. After a few sharp through-the-teeth inward breaths, a test drive (U-turn in the scrap yard) and a couple of nervous handshakes we agreed to purchase Cedric the H-Van and have him delivered to Somerset in January 2010. The Christmas period in 2009 was a tough time for us. The presents, the beers and several turkey dinners helped console our worries, but at the forefront of our mind was Cedric’s wellbeing throughout the Welsh/Antarctic weather conditions. January 2010 came and so did Cedric, he was delivered and stored at Dave and Mary’s barn in Triscombe to whom we are eternally grateful. Not just for the storage but the cakes, the tea, the life coaching and the stories. 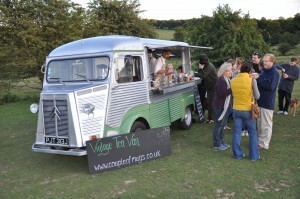 Over a period of 18 months the Vintage Van has undergone extensive surgery both mechanically and cosmetically. A complete brake overhaul, suspension, tyres, lights, a few engine modifications along with rustproofing and a splash of green paint has brought Cedric back to his former glory. The Vintage Van is now available to hire for any event in the Southwest of England, from a 10k fun run to Weddings and Bar Mitzvahs. Get in touch to book our unique, thirst quenching service for your 2013 event. View photos of Cedric’s restoration.